My walk began in Oldbury-on-Severn, using the large car park opposite the local pub, as I had done twice already in 2018. I walked south across farmland in the vague direction of Aust; following muddy bridleways to cross the occasional quiet road. 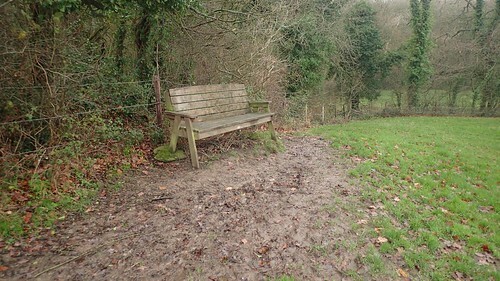 This would lead me to a familiar bench alongside the Jubilee Way. A good hour in to my walk and a pristine opportunity for a short rest. 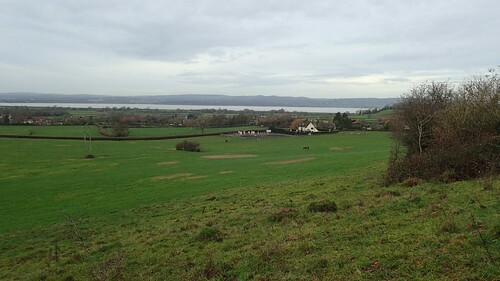 I kept to the Way beyond my break, now walking west towards Littleton-Upon-Severn and via a view of the River Severn and the defunct Oldbury Power Station, from Sacks Hill. 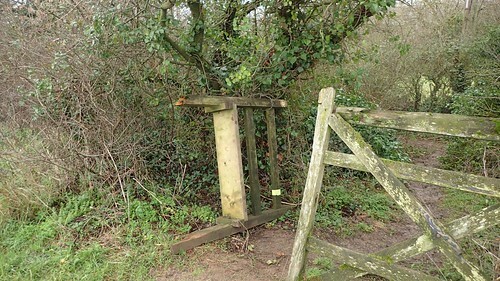 Beside a gate, one stile had been violently upended but still, the waymark was pointing in the correct direction. What really happened here, I wonder? Coming down the next slope from the broken and bypassable stile, I had a good view of the village ahead. I hadn’t actually walked these paths on either of my previous visits to the area and so, it was a bonus for my experience. 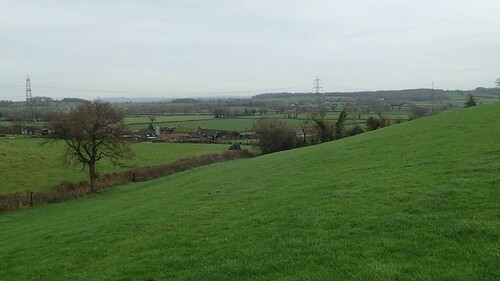 My walk soon continued along familiar paths and bridleways, moving closer to the rushing sound of the M48, bearing bridge-bound traffic heading to and from South Wales. 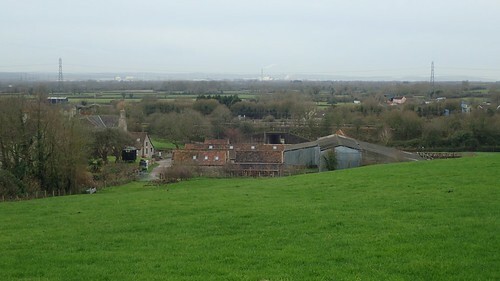 I would descend through Manor Farm before reaching Aust. One of my least-intimidating farmyard experiences. There’s even a holiday cottage available to rent here. 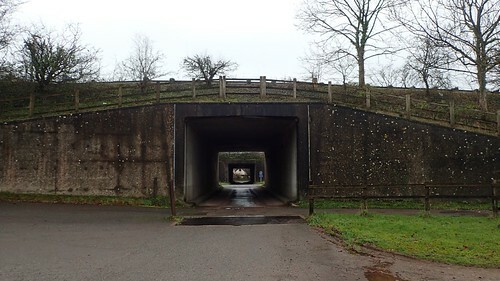 When I led a group walk through this area a few months ago, on a miserably-wet day where I’d hoped to be heading to Wales, we sheltered for lunch under this very bridge; sat on the unused pavement beside the road. Wales or Bristol? One is a city. I can’t help but feel that a small flag symbol should next to the other. 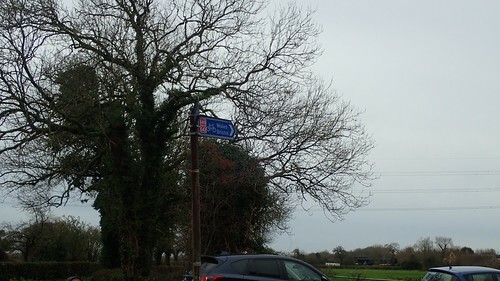 Passing through Aust, beside the church and over the next A-road, I’d soon begin my climb up to cross the original Severn Crossing – now following the Severn Way path. We can all complain about ‘the general public’ taking little or no responsibility for their own waste. 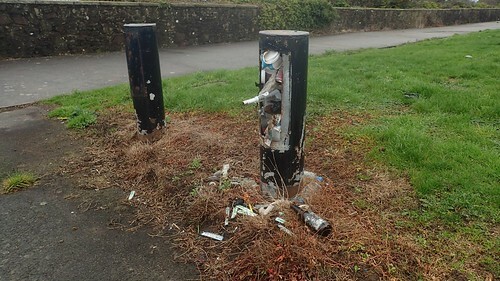 But when a presumed runner or cyclist leaves this behind, I find it extremely disappointing, given the possibility that this culprit may actually appreciate the outdoors. 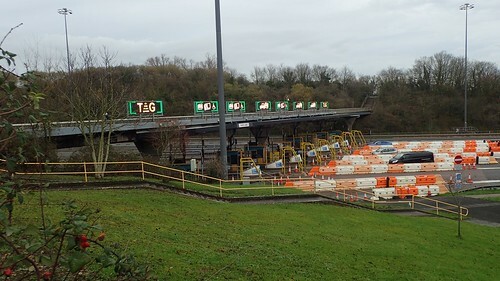 All of the M48 toll booths were in operation, for one final day. I wonder how many people making this journey on this historic day, had contemplated waiting twenty-four hours? Perhaps even a week, for the sake of saving a few pounds? While many of us have anticipated this toll-free route in to the mountains of South Wales, I believe it’s worth thinking about the hundred or so people who have lost their jobs due to the closure; at a time of year when finances may already be tight. I hope those well-mannered people are all able to find something else and soon. Some have speculated that by scrapping the tolls, we’re going to see a regular feature of gridlock on both of the bridges… Outside of Bank Holiday Weekends, I find this hard to believe. I mean, without looking for stories and reports, I’ve never heard of congestion issues on the (free) England-bound side of the drive. I do not believe that many people at all would have gone out of their way to avoid paying the toll, when the long route would undoubtedly see an increase in their fuel consumption. If anything, it’s the holidaymakers, travel-types and pursuits who would’ve felt as though it was ‘not worth doing too often’… I know I’ve often felt this way with my walking! 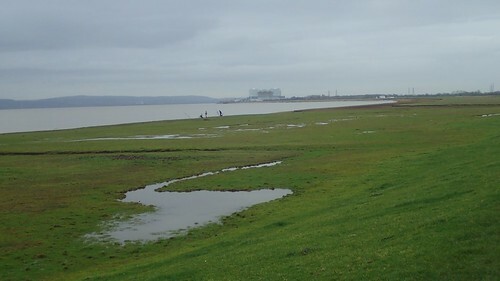 When I first walked this section of the Severn Way, the visibility from here wasn’t anywhere close to being on a par with what you see in these photos. I can’t really imagine many people wandering out here as a highlight of their day. But some ‘less than desirable’ people have clearly been leaving their mark. Over the bridge and I would follow the Severn Way all the way to Oldbury. An hour’s walk. Perhaps a little bit more. I’d wondered whether I might also see other people crossing or visiting the bridge for its final day under ‘commission’. 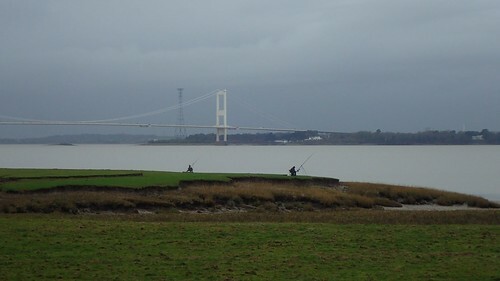 A number of fisherman had positioned themselves along the edge of the river/estuary. I’d not seen anyone here before. It must be the time of year and with the tides at their opportune level. 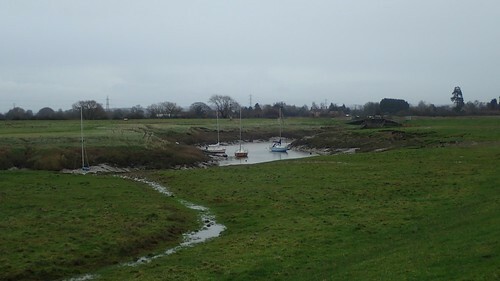 Speaking of the tides… Although I’ve not photographed it, I found evidence that the river level had recently risen to wash driftwood up and over the centre bank on this land and closer to arable farmland. We did see a lot of rainfall in late November/early December. I’d passed one group of walkers, with another ahead of me. This first group had departed the bank to inspect what items had been washed up… One apparently found a ‘perfectly good’ car tyre and was keen to carry it home! 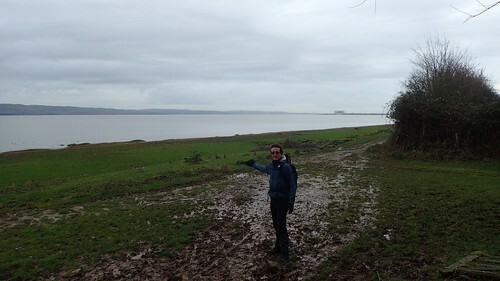 Arriving at the pill outfall, I must follow the Severn Way back in to the village of Oldbury-on-Severn. If you study even the latest map from Ordnanace Survey, you’ll see that there’s no legal way to cross the uninviting water and avoid treading on tarmac too soon. 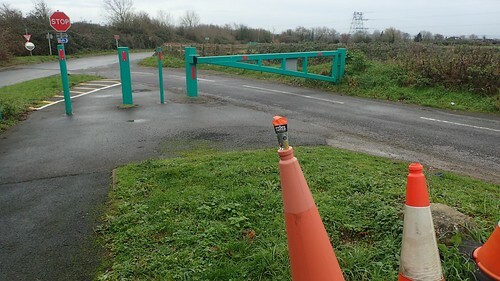 At some time in recent months and with thanks to the efforts of a local Ramblers team, a permissive and direct route through a pair of gates has been created! 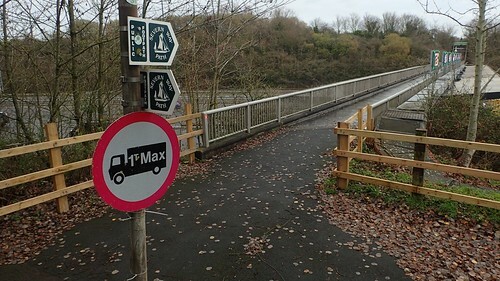 A welcome shortcut for anyone following the Severn Way, perhaps. ‘No cycling’ notices were clearly stated and I’ve previously noticed this on other paths nearby. I try not to voice too many critical words towards cyclists (I’ve had a couple of run-ins but we are all human…). But one thing I do not like is seeing a pair of wheels on a public footpath, as opposed to a bridleway or byway! Ironically, as I walked back towards the village, my path was suddenly interrupted by an impeding cyclist! Not only was he breaking the law ahead of me but he’d clearly been in the wrong to have reached this point from the north! 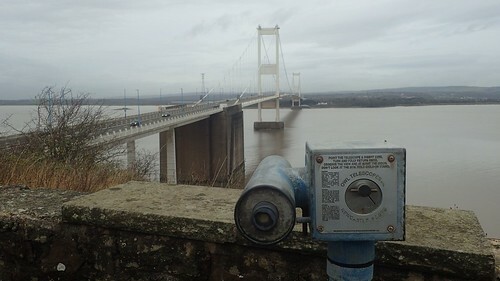 There’s a common opinion within the walking group that we’ll be ‘walking in Wales all the time’, now that the tolls for crossing both of the Severn bridges have been removed. Realistically, I think we’ll still cross over as often as we have done (recruiting walk leaders and maintain a healthy programme of walks remains to be the bigger issue). 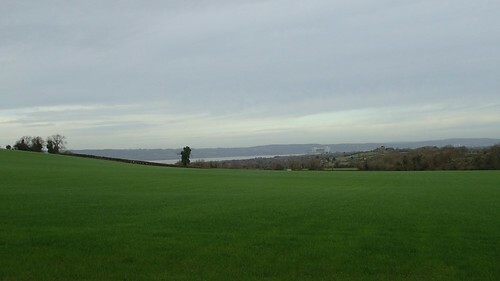 But I like to think that we’ll pay more attention to those green areas closer to the Severn, along with the Wales Coast Path. When you’re having to pay extra to travel somewhere, it’s a human reaction to emphasise the event. Whether that’s heading for the highest mountain, the highest number of mountains and trig points you can squeeze in to one day (ahem) or perhaps only walking the coast in an area that’s commonly regarded as being beautiful. Look out, Wye Valley! Forest of Dean! Ebbw Vale and… Barry?! 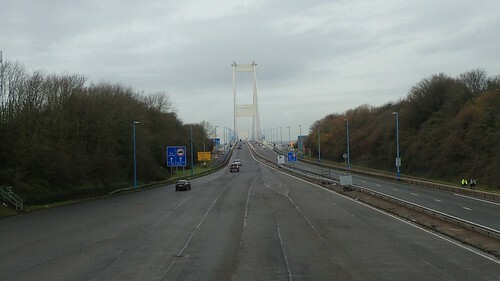 Have your own intentions towards South Wales changed, with the knowledge that the bridge tolls were to be removed? Please comment below, if so. 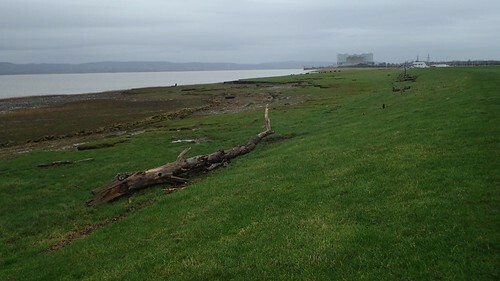 I’ve decided to walk the Offa’s Dyke Path to complete a walk around Wales, having done the coast. So far I’ve done the first two stretches, reaching as far as Pandy. I paid the toll the first time (on the older bridge, the M48), but not the second time as that was last weekend, after the tolls have ended. After that I’ll be far enough north the quickest route is not the M4 anyway. 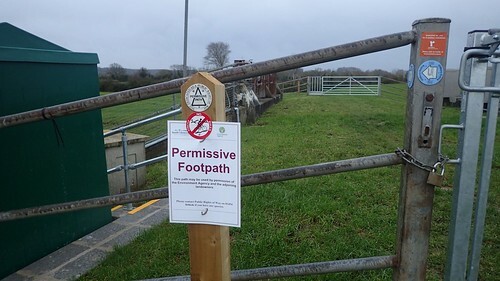 I do wonder what will happen about the public footpath. Currently, as you found, it goes right over the ceiling of the toll booths. If they demolish the toll booths I wonder what whill happen to the path? A new bridge perhaps? Anyway I’m glad to see the tolls go too. Whilst I did not pay them often, it was quite expensive when I do go that way. And I’m glad the Government did not play the same “trick” with the pulled with Dartford tolls. They promised to abolish the tolls there … but replaced them with a congestion charge for the exact same amount. I don’t think that is what people thought would happen when they agreed to abolish the toll! At least now at Dartford there are no toll booths, so you don’t have to stop – but you do have to remember to pay it before the end of the day (online) to avoid a fine. I’m pleased to hear that you’ll be walking Offa’s Dyke this year and I look forward to reading those posts as they emerge. I know Pandy. Is there a particular reason you’ve decided to walk south to north? I hadn’t actually considered the future of the Severn Way crossing the M48… I’ve seen no warnings of or threats towards its future. I’m not sure how structural those booths are but it would be a catastrophic loss if the right to walk across was suddenly gone. Oh, dear. I didn’t know of the Dartford Deceipt. That’s awful. I’ve always avoided driving on a part of the M6 going north because of a similar charge… Which suggests the idea may work, even if it’s a blatant means of stealing easy cash from us. Regarding Offa’s Dyke, I’m walking south to north, but as a series of day walks. In this case I walked from Monmouth to Pandy because that worked out much better with the bus connections. I took the bus from Pandy to Abergavenny and then another bus from there back to Monmouth (there isn’t a direct service). End-to-end journey time was 1 hour. However the connections didn’t work in the other direction and so I’d end up with a 1 hour wait in Abergavenny (so giving a 2 hour journey end-toend). In addition the last bus was earlier in the other direction which meants that I would not be able to do it all in daylight – I’d have to have arrived so early I’d have set off when it was still dark! So each day walk will see me completing more of the path from south to north …. but I might do that days walk north to south (if that makes sense!). I think for the next stretch I will drive to Hereford and end up doing the same, but to Hay-on-Wye and walk back to Pandy, where I can take another bus back to Hereford. It’s a pain that public transport is quite limited along much of Offa’s Dyke (and a lot of it does not run on Sundays either meaning to do a weekend trip requires a very expensive taxi). I always admire your perseverance in making the most of public transport, where possible. People sometimes complain about the volume of cars on the roads but, in more rural areas like this, it’s clearly essential to have a car in order to go anywhere without too much hassle. Setting off in the dark is not a prospect that would’ve appealed to me either. An even bigger pain that so few buses operate on a Sunday.